Gnocchi, which means “dumpling” in Italian, it is a made from a soft potato dough. I’ve taken this Italian classic and married it with another classic – mac n’ cheese. The result is a twist on these two traditional dishes. 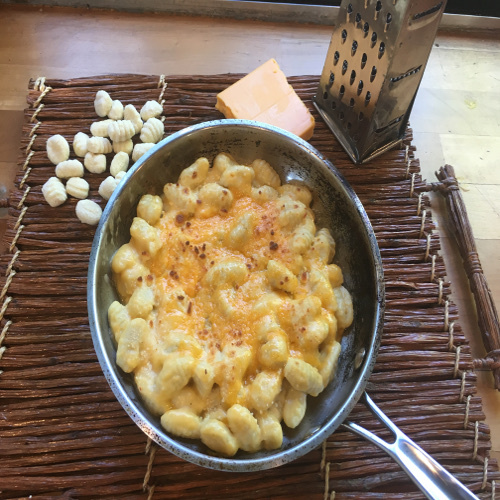 A lighter vision of mac n’ cheese made with gnocchi. 1. In a small sauce pan, add the stock, milk and flour. Whisk until the flour is dissolved. Bring to a slow boil, then turn the heat down and simmer for 3 minutes or until slightly thickened. Add the salt and pepper, the Parmesan and three-quarters of the cheddar cheese. Cook for 1 minute. 2. Meanwhile cook the gnocchi according to the direction on the package. 3. Pour over the gnocchi, mix well and garnish with remaining cheddar cheese.